More than 50 years have passed since Yale psychologist Stanley Milgram conducted several highly controversial experiments to determine just how far people would go in the name of following orders. Now, a new study has built on Milgram’s experiments and come to a terrifying conclusion: 90 percent of participants would electrocute an innocent person simply because they were told to do so. The Milgram studies found a large proportion of participants willing to obey such instructions way back then, and the same apparently holds true after all these years. Milgram’s original experiment was a behavioral study of obedience — a subject which some say became of great interest following the Holocaust and the lingering question of how many Nazis were simply following orders. Published in 1963, the study consisted of a series of experiments that measured a person’s willingness to obey orders given by an authority figure, even at the cost of physically harming an innocent stranger. 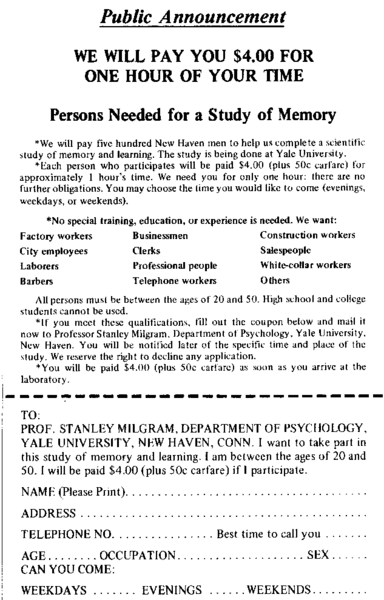 When Milgram and his team conducted their first study, they had willing participants, each paid four dollars for their time. While all participants lived in and around the New Haven, Connecticut area, they varied in other critical ways: ages ranged from 20-50, as did their professional status. A fellow participant would introduce other participants to one another, and they would then drew straws to determine who would be the “learner” and the “teacher,” the latter of which was placed in a room with a figure of authority — in this case, a scientist. The learner was seated in a separate room with a series of buttons placed in front of them, and the pair communicated via a microphone. The teacher then began asking a number of predetermined questions. If the learner got the answer to any of the questions wrong, the teacher administered a shock, which was sent to the learner via electrodes affixed to the skin. The learner could be seen wincing in pain each time a shock was delivered, yet the teacher was instructed to continue doling out such punishment with every incorrect answer. Wikimedia CommonsA participant recruitment flyer for one of the original Milgram experiments. As far as the severity of the punishments, teachers were presented with 30 knobs, each labeled with varying degrees of voltage ranging from 15 to 450. Learners could be seen and heard grunting, contorting in pain, screaming, and pleading for their tormentor to stop. Some even complained of heart pain when the voltage got high enough. So what could convince a person to continue to shock a stranger who was pleading with them to relent? Orders from an authority figure. 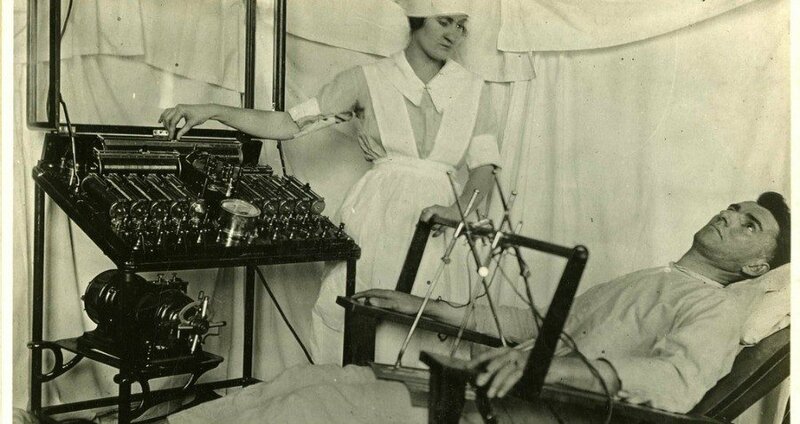 As the experiment continued, most teachers became less inclined to go on. Scientists often met this resistance with specific prompts, or prods. At the first sign of dissent, the scientists simply asked the teachers to please continue. Next, the scientists told the teachers they were required to continue. In the third prod, the scientists stated that it was absolutely essential that they continue. And ultimately, the fourth and final prod informed the teachers that they had no other choice but to continue. Sixty-five percent of the teachers continued to the highest level of 450 volts under such orders. One hundred percent made it to 300 volts before finally refusing to continue. While this certainly sounds sinister, it’s important to note that the “learners” involved in each experiment were actors, all of whom were in on the game from the jump. While they received minor shocks to elicit a more “authentic” reaction, for the most part, the grimaces, twitches, and outward exclamations of pain were fabricated. Even the drawing of straws in the earliest experiment was rigged to produce a fixed outcome: It always placed a confidant of Milgram’s in the learner’s seat. This news, when it was finally revealed at experiment’s end, certainly came as a relief to the teachers who had inflicted pain and suffering on their learners. Many believed they had actually killed their counterpart in the name of a four-dollar science experiment. Some teachers, however, reacted surprisingly, either justifying their actions, blaming the experimenter doling out orders, or even blaming the learners themselves, calling them stupid and deserving of such a punishment. Very few questioned the experimenter’s authority. Milgram conducted the experiment 18 times, and the consistently large percentage of participants willing to go all the way baffled him and his colleagues. The recent study, which yielded an even larger percentage of compliant followers, elicited the same response among researchers. The latest experiment — whose results were published in the journal of the Society for Personality and Social Psychology — was nearly identical to Milgram’s, save for the fact that only 80 people participated and the experiments took place in Poland. Interestingly, and perhaps symptomatic of another aspect of human behavior that has not vanished over the years, researchers noted that the number of people who refused to administer shocks grew to three times greater when faced with a female learner. For more scary experiments, check out the human radiation tests that the U.S. government secretly conducted on U.S. citizens. Then, discover four of the most evil science experiments ever performed.